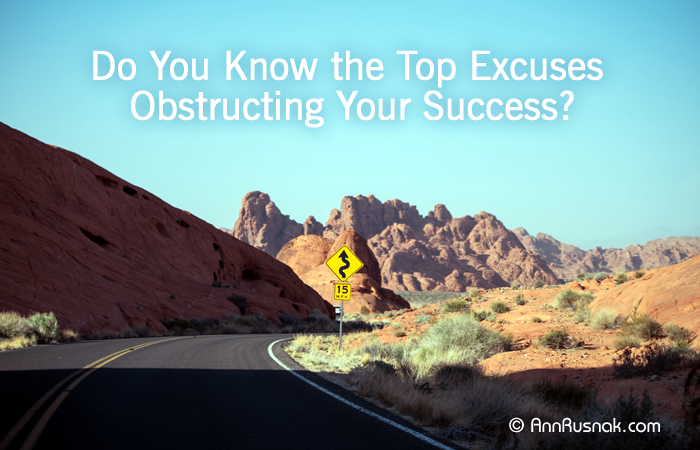 Do You Know the Top Excuses Obstructing Your Success? I don’t have the right education. A surprising percentage of the most successful people never completed high school. It’s true that education is required to be a doctor, lawyer, or engineer, but education isn’t required in many situations. I don’t have enough money. Many of those wealthy in the present were poor in the past. Some of the biggest companies were started in a one-car garage. Money certainly makes things easier, but it’s not always necessary to get started. I don’t have enough time. With careful planning, you can find time in your schedule for your priorities. How much extra time do you need to achieve your goals? If you regularly overextend yourself by saying Yes every time someone asks you to do something, practice politely saying No untilyou can sometimes make that your answer. It’s too late to get started. Do you think life has passed you by? An 80 year-old man climbed Mount Everest successfully. People over the age of 60 have graduated from medical school. Is it really too late? It’s possible that your age or life circumstances can make success more challenging, but it’s unlikely that it’s too late. I found myself using this excuse until I did research on people who succeed in their later life. Do the same and use their stories for inspiration. I don’t know how to get started. There was a time when Tiger Woods didn’t know how to play golf and Warren Buffett couldn’t even spell "stock." It might be true that you don’t know how to get started. That just means you require some education. Knowledge doesn’t replace action. Repeated action will lead to mastery. Don’t be afraid to make mistakes along the way. Imagine finally discovering limiting belief behind your excuse, which keep you from realizing your dreams! 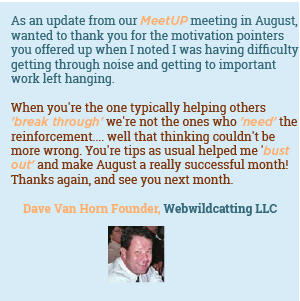 Discover how Ann Rusnak can take you from Stuck to Unstoppable Success with a complimentary 20 minute "Chat with Ann" consultation. Schedule Yours Now! We all carry around numerous limiting beliefs. They profoundly affect your life in so many ways, and none of them are good and will keep you from reaching your full potential. Your beliefs about yourself and your life have more power over your existence than you can imagine. Personal ideas and values you’ve held for a long time can block the way toward a life you desire. You’re probably familiar with the idea of how limiting beliefs prevent the success you desire. But, were you aware of how they also create a negative impact in other areas in your life? 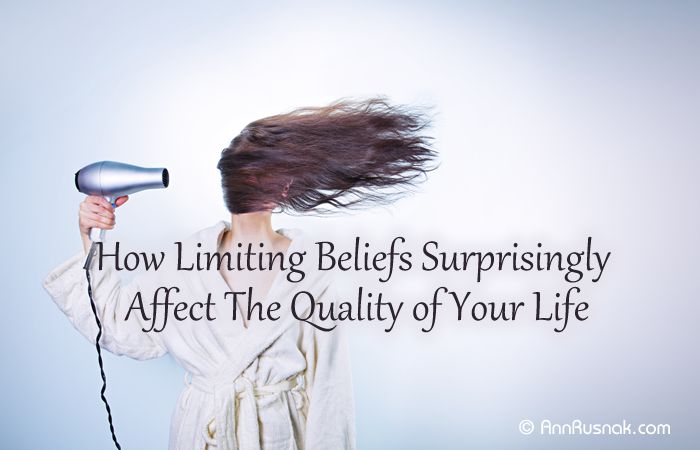 Limiting beliefs spoil your experience of living. You will do fewer things over the course of your life when you’re constricted by your limiting beliefs. Close your eyes and imagine how much your life would be fuller, richer without them. You unintentionally harm those around you. They say the road to hell is paved with good intentions. You affect others, including friends, with your limiting beliefs by sharing your misinformed advice. Even worse, you’ll likely teach your children false ideas that limit them. Limiting beliefs, the gift that keeps on giving, generation after generation. Is this the type of inheritance you want to pass down? What beliefs do find yourself repeating to your children that your parents told you? Examples: Money does not grow on trees. You got to work hard for success. No rest for the wicked. Money doesn’t buy happiness. Start paying attention to what family motto’s you’re repeating. Limiting beliefs cause you to get off track and look for alternative path, if you look for one at all. Even though you may be on the best route to achieving what you want, your beliefs can convince you otherwise. You spend a lot of time, even years, following a less direct path in an effort to follow your false beliefs. You will save some time, grief and frustration by dealing with your limiting belief instead. Trust your intuition, it knows the right actions to take and don’t give into the belief that want to override it. You fail to grow fully as a human being. View your life with the purpose of eliminating your limiting beliefs and experiencing everything in the world that appeals to you. If you only did those 2 actions, what kind of life would you have lived over the course of your lifetime? Write out a vision for your life with no limitations. Let your imagination go. Are you on that path right now? People often start a business in hopes of living the life of their dreams. You bring those same beliefs into your business and they will profoundly influence the results you achieve for your efforts. This is why working harder can leave you feeling stuck no matter what you do. Your beliefs have you working against yourself. Good news! 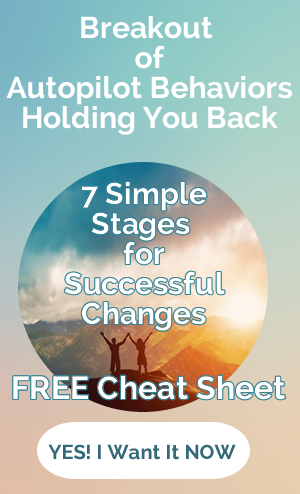 You can eliminate your limiting beliefs and replace them with beliefs that empower you. Make replacing those beliefs fun by focusing on how your new empowering belief will make your life easier and enable you to enjoy the success you deserve and desire.